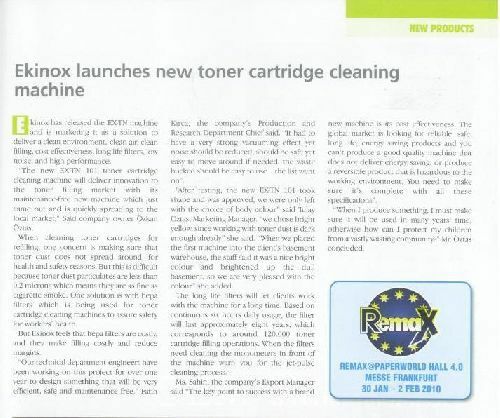 Ekinox, a Turkey-based technology oriented company, continues to launch top-notch machines in the field of toner cartridge re manufacturing following its green orientation to provide environmentally friendly products. Ekinox is aiming to offer its customers products providing the combination of the following characteristics: power, quality and environmentally friendly. For this reason, the desing and R&D teams of the company strive to create new products without compromising on functionality, quality and unique designs as every product is in accordance with the required standards and newest technologies. Thanks to its powerful DIN EN 60335 standard filter, Class M, that vacuums toner particles of 0,2 micros when cleaning and filling toner cartridges, the filter prevents toner dust from entering the atmosphere and keeps the work environment clean. By its powerful vacuuming, clean and quality cartridge filling is achieved. Offering high-quality filling machines, Ekinox machines prove their reliability, the company also offers extended warranties for its products. 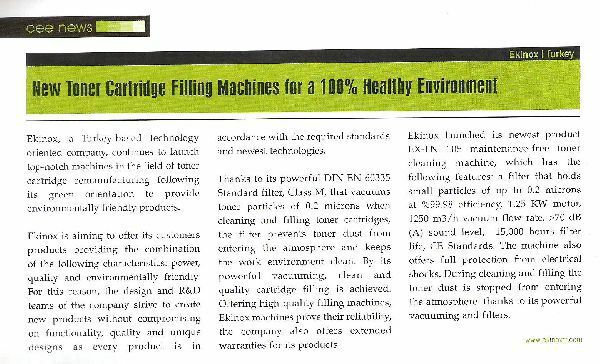 Ekinox launched its newest product EX-TN 105 maintenance-free toner cleaning machine, which has the following features: a filter that holds small particles of up to 0,2 microns at %99,98 efficiency, 1,25 KW motor, 1250 m3/h vacuum flow rate,>70 dB (A) sound level, 15,000 hours filter life, CE Standards. The machine also offers full protection from entering the atmosphere thanks to its powerful vacuuming and filters.